Here's another smoothie that will help all my fellow uterus-wielders get through that tough time of the month! 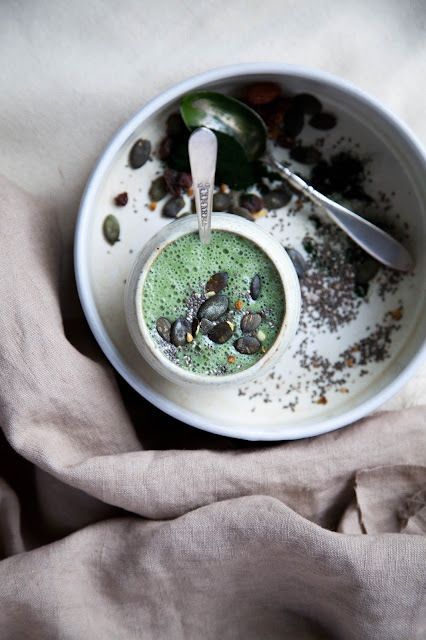 Ginger and fennel have been proven to ease cramps and lessen flow, and chlorella has a high amount of iron in it (29% of your DV in one teaspoon) which we tend to get low in around that time of month. On top of that, my fave chlorella product, Sun Chlorella Pure Powder, gives you - in one teaspoon - 88% of your DV for vitamin A, 53% of your B12, and 700% for vitamin D. I try to have some in a smoothie every one or two days. I am basically just amazed by mother nature when all we have to do is gently process and refine a plant - in this case, algae - to unlock all that nutritional power. My body is happy when I consume chlorella and other greens regularly. Fresh greens are something I am quite bad at getting in everyday. I know, I know. I'm a vegan: aren't lettuce and kale all I eat!? Well, no. Definitely no. My diet mostly consists of raw treats (just look at my blog, helloooo), fruit smoothies, beans, tofu, and roasted veggies with savoury sauces and pasta or rice. I can go days without even thinking about leafy greens. I am too lazy for salad; don't judge me. So green powders like chlorella are the ideal way for me to give my bod all that green goodness (B vitamins, iron, protein and probably a bunch of other beneficial stuff we don't even know about yet), without having to buy, rinse and prepare 10 lbs of spinach every week. Hehe. 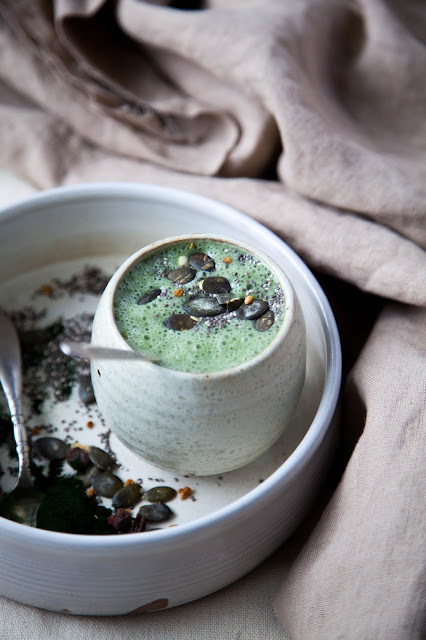 I threw some other super power foods in this recipe as well, including ashwaganda, an adaptogen that's been used Ayurvedically for centuries to help with stress, and may play a part in preventing cancer and lengthening your life by protecting your telomeres. SOUNDS GOOD. This post was sponsored by Sun Chlorella cuz I got bills to pay, but all opinions are my own. Blend everything together until smooth! Enjoy.